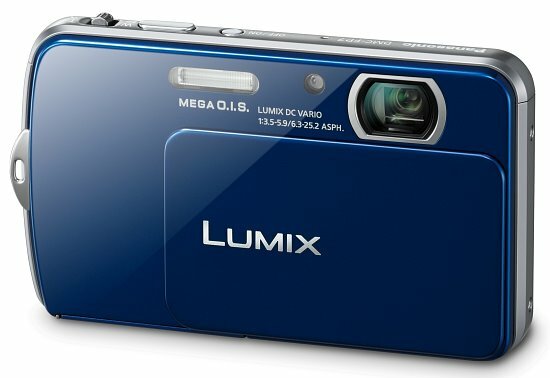 The presumably more expensive (pricing won't be announced until 30 days prior to shipping) of Panasonic's new FP-series ultra-compact digicams, the DMC-FP7 boasts a 16.1-megapixel sensor, a 4x optical zoom, a sleek mirror finish, 720p HD video recording, Panasonic's Intelligent Auto, and a large 3.5-inch, 16:9 aspect LCD touchscreen. The Smart Touch Screen allows owners to access all menu setting options (including Touch Auto Focus, Touch Zoom, Touch Shutter, and Intelligent Scene Selector) as well as simple finger-dragging image and video browsing during playback mode. Touch-of-the-finger editing for photos is an FP7 exclusive feature with Beauty Retouch mode (retouching faces), Esthetic mode (clear skin textures and whiten teeth), and Make-up mode (coloring options including foundation, eye-shadow, lips and cheeks). Panasonic's iA mode is included on both the FP7 and FP5. New to this model year are AF Tracking (for following moving subjects), and Intelligent Exposure (prevents blocked shadows and blown highlights). As always, MEGA OIS (Optical Image Stabilization), Intelligent ISO Control, Face Detection, and Intelligent Scene Selector are all available via the dedicated iA button. Though it won't get you far on 16.1-megapixels, the FP7 does in have 70MB of built-in memory just in case your SD card happens to run out. Another nice feature is the ability to upload images to Facebook and videos to YouTube directly from the camera once you plug it into your PC or Mac via the included USB cable. Pricing and availability details for the Panasonic LUMIX FP7 will be announced 30 days prior to shipping. The FP7 will be available in blue, black, and red.